Ottawa lawyer J.L. Lee Mullowney informed us that he was contacted by the purported Thomas Moss looking to retain him with regards to a breach of a business loan agreement. Well aware that he was being targeted for a fraud, Mr Mullowney called the fraudster up to challenge him on a number of incongruities on the matter (see below for the full details of the scam). He recorded the call and posted it to Youtube. The call shows how on one hand, fraudsters will go to great lengths to make their matters seem legitimate by answering phone calls, preparing documentation and fake cheques, etc., but when pressed on certain details their stories quickly fall apart. By posting the hundreds of examples of these kinds of scams, we hope eventually all lawyers will be able to spot the red flags of an online fraud. 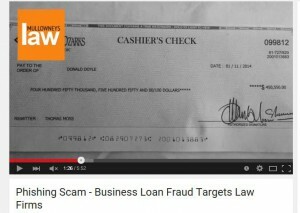 The fraud itself is a classic bad cheque scam that presents as legal matter requiring the assistance of a lawyer. In this scam lawyers will be duped into wiring real funds from their trust accounts after depositing a fake cheque received as payment from the debtor (who is part of the fraud). What was different in the case of this fraud attempt was that the initial contact was by telephone. Normally it’s by email, which makes it easier to spot (“Dear attorney” is a good giveaway). I had loaned my close friend and associate the sum of $450,550 for the purpose of injecting it into his business to be paid back within a year after date of agreement but he has been short of fufilling the agreement as its over a year aleady. He has only paid $120,500 out of a total $450,550 the balance is still outstanding till this day. I have been in constant contact with Donald P. Doyle and even though he has promised that he would pay , I think the threat or possibility of litigation would serve as a catalyst to make them pay sooner rather than later. i am prepared to pay a reasonable retainer or collection costs for this service as soon as I get an engagement letter from your firm. I expect this to be a non-litigation collection from the borrower but i am prepared to litigate this matter if Donald P. Doyle is not ready to pay the balance owed on the loan agreement. I have attached to this e-mail a copy of the loan agreement promissory note for your perusal and i also included Donald P. Doyle contact information for your use, i believe he will apreciate getting contacted by a law representative. I want to also let you know that this loan that i gave to Donald P. Doyle, has caused considerable strain on my business operational capital and personal finances.